I am beginning to think that this global warming crisis is a sinister plot by statistics professors to get more students to take statistics courses. 😉 Despite my misgivings about the true motives of global warming I will take the opportunity to give a big thanks to LuboÅ¡ for encouraging me to refresh my knowledge of regression analysis. In his post, The Reference Frame: No statistically significant warming since 1995, he shows a simple example of regression analysis of temperature anomalies. Since I am Mathematica challenged I opted to use a method a high school student would probably be familiar with, I used Excel. Without much effort I was able to quickly plot add a trend line to the Excel chart with the following equation on the chart, y = 0.0095x + 0.12 with a R2 = 0.0889. LuboÅ¡ was kind enough to provide me with a link to the AP Tutorial on Statistics so that I would be reminded on the prerequisites for regression analysis. The Coefficient of Determination or otherwise known as R2 is a key output of regression analysis. To paraphrase the AP Tutorial for this case, the variance of the temperature anomalies are 8.9% predictable from the time variable. Ugh! So whether you look at the confidence interval, Standard Error, or R2, it is reasonable to conclude that the temperature data is really ugly and to agree with LuboÅ¡ that the underlying trend in 1995-2009 was "somewhat more likely than not" a warming trend rather than a cooling trend. For kicks I decided to follow up on a comment Bret made on this same article posted on the Watts Up With That? blog concerning using monthly data. 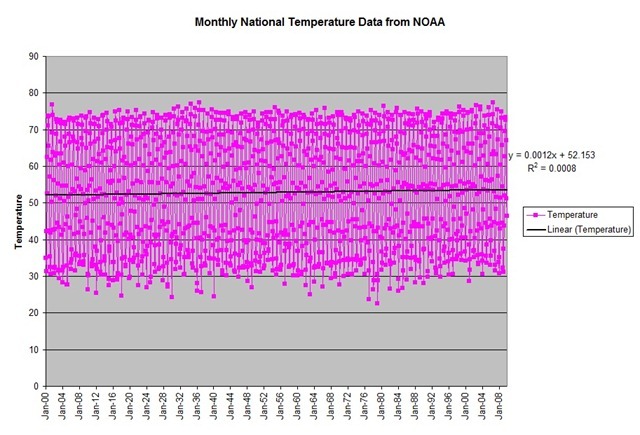 I found some suitable monthly temperature data at http://www7.ncdc.noaa.gov/CDO/CDODivisionalSelect.jsp, imported it into Excel, and plotted it. Here is the result. Some people may complain that this chart is a nonsensical plot since the seasonal variations overwhelms the temperature trend. On the other hand it highlights how small the slope of the trend line is compared to the seasonal variations. Regardless of which estimate of the temperature increase you choose, it is still a very small number compared to the seasonal temperature variations. Another complaint might be that I should have used temperature anomalies rather than the actual temperature data. This begs the question whether you can have a warming trend that shows up in the anomalies that doesn’t show up in actual temperature data. Oh-oh! I think I should move on to less contentious subjects. Since I was on a roll I decided to go one step further and analyze the temperature data like it was weather. Oops! I put climate change and weather in the same sentence. Every time I see or hear a weather forecast they discuss the high and low temperatures for the day. I do not remember ever hearing a weather forecast that included the average temperature for the day. In some cases a weather forecast will include an average high or low for the day. 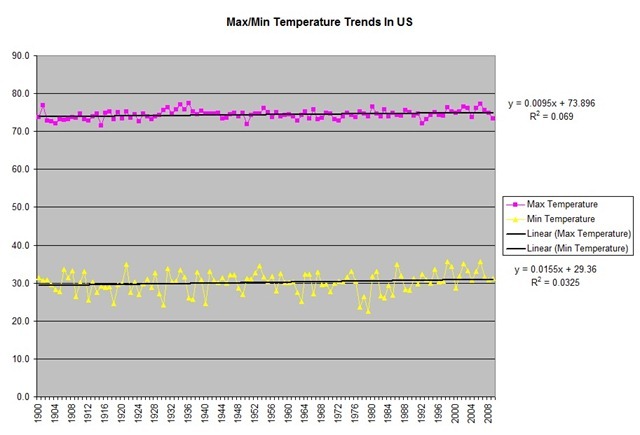 Hence I created a plot of the maximum and minimum monthly temperature for each year. This appealed to both my pragmatic view and my engineering background. If we can imagine that our climate is a control system, a control engineer would primarily be interested in setting control limits on the maximum and the minimum values. Surely we should get a better regression analysis using the annual maximum and minimum values. Once again despite selecting a subset of the monthly temperature data that should have had a better chance of a statistically relevant temperature trend, the regression statistics continue to make it difficult about drawing conclusions about warming or cooling trends. The R2 value for the maximum temperature and minimum temperature trends are better than the raw monthly trend but they are still very low. Once again the underlying trend is "somewhat more likely than not" a warming trend rather than a cooling trend. The R2 value has improved but with it so low, we are still saying very little. Here are some more thoughts to ponder. The range in the system from high to low temperature, 44 degrees, is very large compared to the warming trend(~ 1 degree/century). My inner engineer is having trouble understanding why a climate system that can handle a 44 degree swing in temperatures is having problems with a warming trend of about a degree per century. Are the problems we are seeing with the R2 value in our regressions analysis a natural result of the errors(noise) in the system of measuring temperatures? As an example if our temperature measurements are limited to an accuracy of plus or minus one degree, are we not fundamentally limited by the measurement errors in the system. What can we say about warming trends of one degree per century if our measurement errors are likely to be as large as the trend? How low does a R2 value or confidence limits in trends need to go before we decide to pack it in and say we do not know what is happening? Finally for a humorous look at the scientific process courtesy of xkcd.com we have the Science Montage. This entry was posted in Climate Change, Humor. Bookmark the permalink.